Again, I have to ask. What the heck is that? Why it's a rocket stove of course. Actually its two rocket stoves combined into one awesome cook top! Check out my short video review of the EcoZoom Versa on the PrepperConTV YouTube channel. 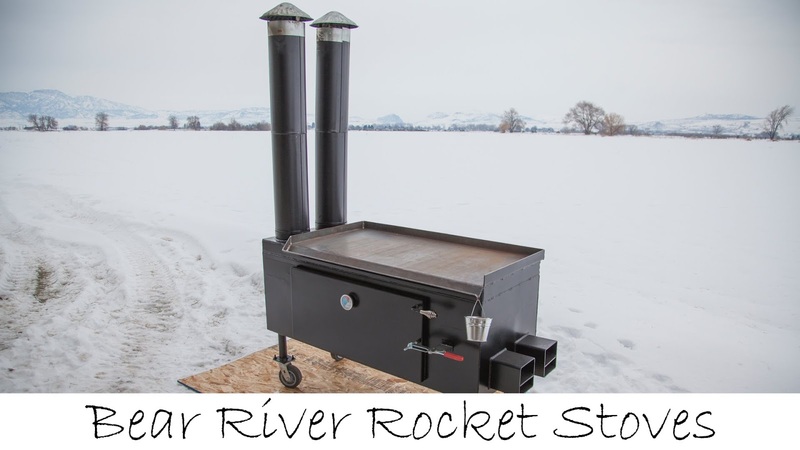 Why have rocket stoves become so popular lately? If you have not used a rocket stove then perhaps the answer to this question eludes you. Consider that cooking outside over a fire can be a bit of a chore. Lots of wood to gather and cut and smoke to deal with. 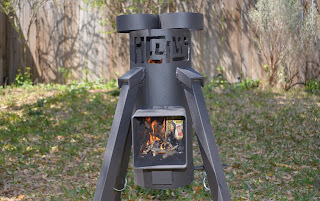 What is a rocket stove you ask? To meet the criteria of a true rocket stove there must exist a few essential traits. It must have a combustion chamber, chimney and an opening at the combustion chamber level where the fuel is added. Fuel can be wood, charcoal or other biomass. The addition of insulation to the combustion chamber and chimney as well as a grate under the fire to allow for air to flow in under the fire all make for a superior design and more efficient performance. These principles ensure that the fire will be an efficient, hot and clean burning fire, with the ability to control temperature with the amount of fuel. A hot fire means a more complete burn of the fuel which means less smoke. 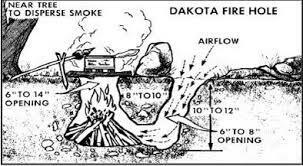 The beginnings of the rocket stove idea perhaps came from the Dakota fire hole. A small hole is dug in the ground to contain a fire and then a tunnel is dug to provide air flow to the bottom at the base of the fire in the first hole. See the image below. This method creates a direct and concentrated path of air flow to be drawn in from the second hole to the base of the fire which then flows out the top of the hole. There are many different designs and ways to build your own rocket stove. Just do a simple internet search and you'll find lots of great ideas. The EcoZoom Versa has taken all of these principles and combined them into what I consider to be the perfect package. EcoZoom designed this stove for a specific purpose. Cooking fires in Africa contribute greatly to pollution. Wood can also be difficult to come by. 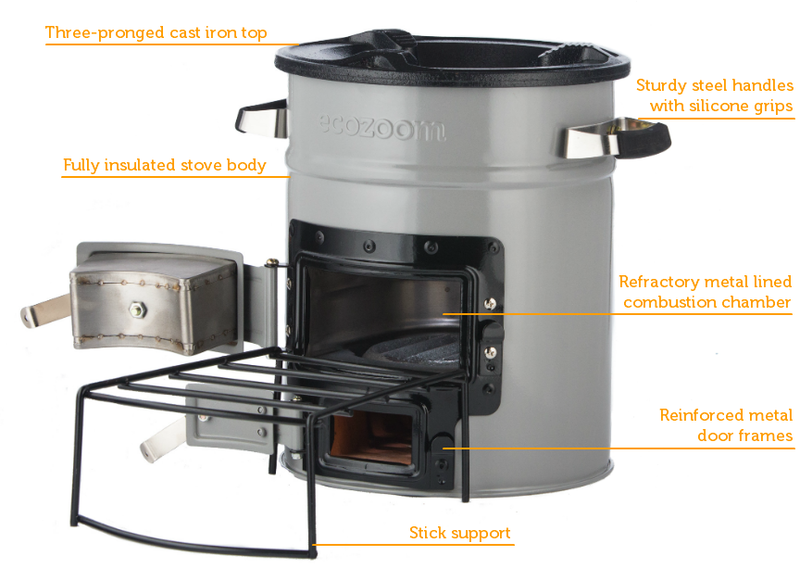 Fueled mostly by small sticks and other biomass, rocket stoves require a lot less fuel than cooking over an open fire. For these same reasons the Versa or Dura meet my emergency preparedness campfire cooking needs. We have a few large trees on our small urban lot. Falling branches is the norm and many get trimmed each year. I have been stashing branches to be used as firewood. These small branches are the perfect fuel source for rocket stoves. I use the small twigs to get the fire started and then feed the larger sticks into the combustion chamber. It took less than 6 sticks smaller than the diameter of my index finger and 14" to 18" in length to boil a 2 liter pot of water. Once the kindling got the larger sticks burning well there was virtually no smoke. I used my infrared thermometer to check the temps. Inside the combustion chamber the fire measured upwards of 850F with the insides of the chimney around 650F. To achieve these temperatures with such little wood is impressive! The outside of the Versa got as hot as 140+F. I was able to touch the sides momentarily without getting burned but they were quite hot. I must say that cooking over the EcoZoom Versa was the easiest fire I've ever lit, the simplest fire to keep going and the most pleasant cooking experience with fire I've ever had. Clean up was no chore either. After letting the stove cool I simply dumped the ashes out of the bottom of the stove and wiped it off with a paper towel. The EcoZoom Versa weighs just over 14 pounds. so I will not be backpacking it in anywhere. But for ease of use at home during a power outage and car camping the weight is not an issue whatsoever. I honestly can not imagine a better, easier or more efficient way to cook with fire than with this stove! When I first saw it I knew I had to have one. My instincts and experience served me well. I was not wrong. 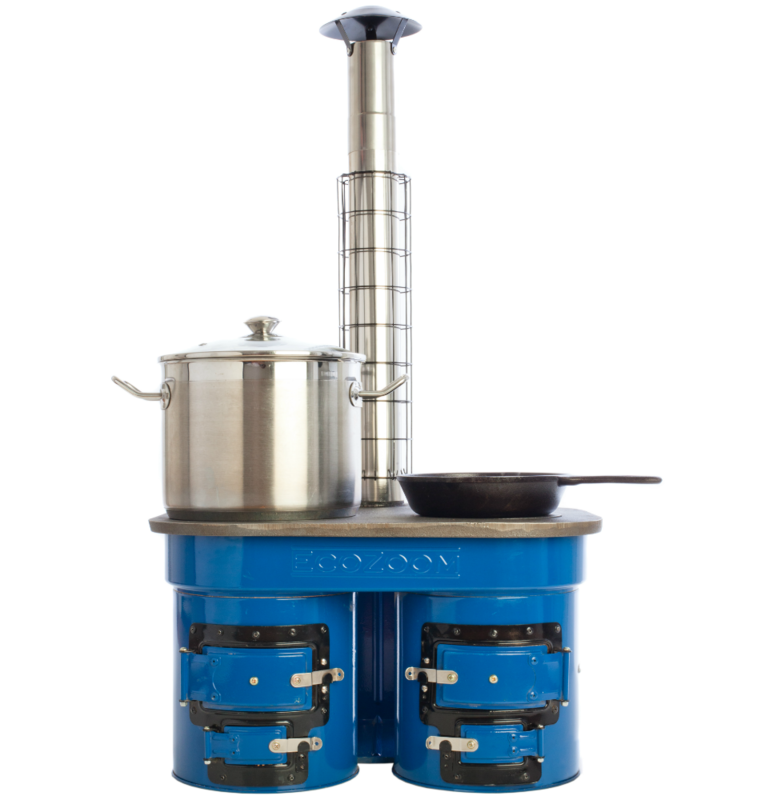 There are many reasons to cook over a rocket stove rather than an open fire. In an emergency or SHTF scenario you may have a limited amount of fuel. An open fire not only uses as much as 50% more wood but also produces a lot more smoke. Smoke is not only irritating and bad for your health but it can also give away your location. An open fire is also messier and more dangerous. I've always preferred to cook over a gas stove when camping rather than an open fire. In an extended emergency propane and other fuels will be costly and hard to get. Adding the ability to cook over a fire fills an essential void and diversifies your means of cooking. Having multiple and various means of performing essential tasks is vital. Cooking included. 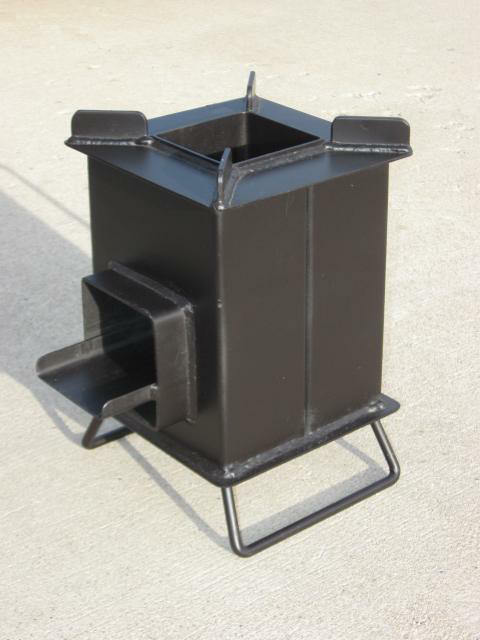 Adding a rocket stove to your preparations will increase your ability to feed your family a hot meal during a crisis. 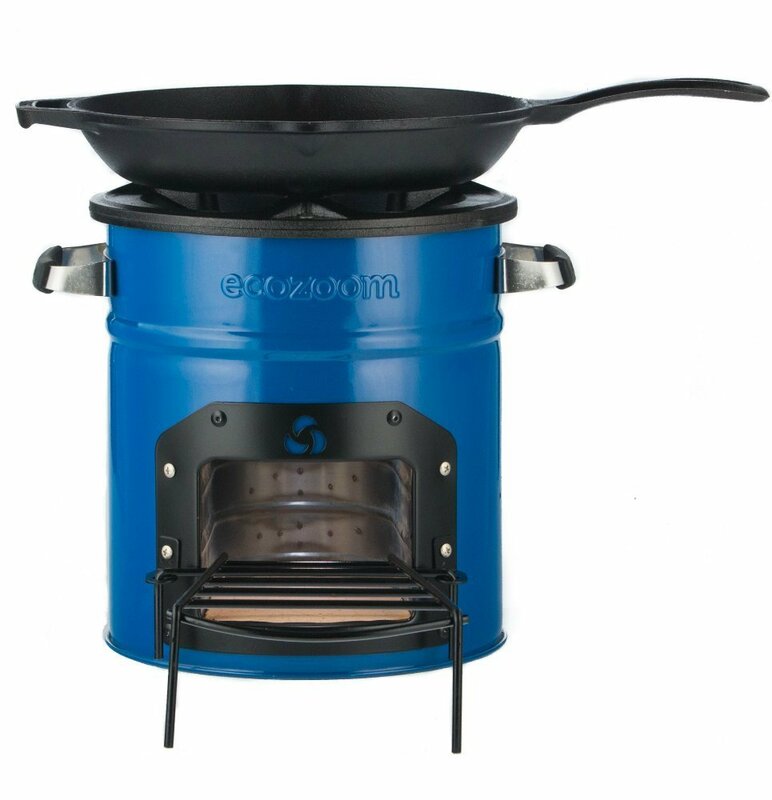 If the EcoZoom stoves are considered light or middleweight of rocket stoves then these could be considered the heavyweights. or the super heavyweight www.bearriverrocketstoves.com. FYI. I choose to call the EcoZoom Versa the "Champion of rocket stoves" because it is superior in every way to any of the rocket stoves I have compared it to thus far. Superior in features, size, value, durability, portability, ease of use, and quality of build. I have yet to compare it head to head with the Silver Fire brand rocket stoves which seem like excellent quality products. However, my basic comparison of the two still gives the advantage to the Versa in my opinion.